Builder: Vosper Thornycroft Shipbuilding, Woolston, Southampton, U.K.
HMS Gloucester was a Batch 3 Type 42 destroyer of the Royal Navy. The ship was built by Vosper Thorneycroft at Woolston, Southampton and launched on 2 November 1982 by The Duchess of Gloucester. Gloucester was one of the modified last four of the class to be built, having a lengthened hull design giving better seakeeping qualities and greater endurance. The flight deck recognition letters worn by Gloucester were GC, and her international callsign was GBBF. 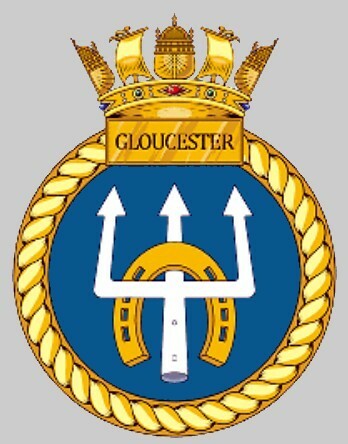 Gloucester served in the Gulf War in 1991 under the command of Commander (later Rear Admiral) Philip Wilcocks where her most notable action was the firing of a salvo shot of Sea Dart missiles to shoot an Iraqi Silkworm missile that was threatening the US battleship USS Missouri and allied minehunters; the first successful missile versus missile engagement at sea in combat by any Navy. The ship also survived attacks from two naval mines and conducted numerous boardings using her boarding party consisting of Royal Navy and Royal Marine personnel. The ship's Lynx helicopter also engaged seven Iraqi warships. She spent the longest period upthreat of any coalition warship. As a result of her endeavours, her captain (Commander Philip Wilcocks) and flight commander (Lt Cdr David Livingstone) were decorated with the Distinguished Service Cross; the operations officer and flight observer were both mentioned in Despatches. After this service Gloucester was rebranded with her nickname of "The Fighting G". 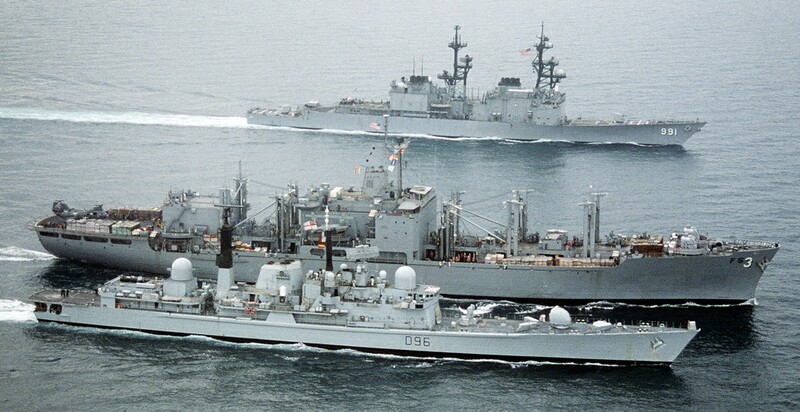 During the 2006 Israel-Lebanon conflict, Gloucester was the first Royal Navy vessel to evacuate British nationals from Beirut, berthing on 18 July 2006. She made three trips taking evacuees to Cyprus, and was the last Royal Navy ship to leave Beirut. She underwent a £6 million refit at Rosyth Dockyard in Fife, Scotland, in 2007. On the morning of 26 August 2010 she intercepted the yacht Tortuga, smuggling £4 million of cocaine, during Gloucester's voyage out to the Falkland Islands, where she was deployed from August 2010 to early 2011. On 20 September 2010 the government of Uruguay denied Gloucester access to Montevideo as a result of the Falkland Islands sovereignty dispute. In May 2011, she took part in Exercise Saxon Warrior. 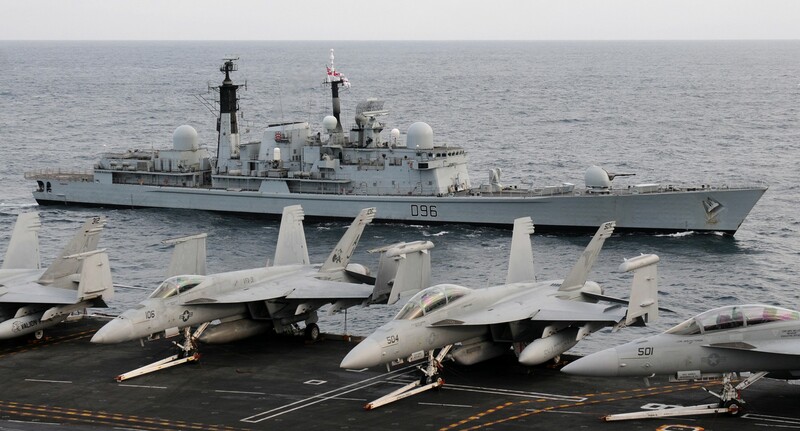 As part of Saxon Warrior '11, on 21 May 2011, Carrier Strike Group 2's Truxtun and Mitscher joined the U.S. replenishment tanker Leroy Grumman and the Spanish frigate Almirante Juan de Borbón in conducting a transit exercise, with Gloucester and frigate Westminster acting as hostile forces. This was the final deployment for Gloucester prior to its decommissioning. Gloucester returned to HMNB Portsmouth for the final time on 24 May 2011 and decommissioned on 30 June 2011, under the command of her last captain, Commander David George. On 22 September 2015 she left Portsmouth harbour under tow, bound for a breaker's yard in Turkey.